Arthouse Hobart is one of a select group of short term accommodation homes fully approved by Hobart City Council. We pride ourselves on providing a high quality family experience in a relaxing and peaceful environment at an affordable rate. Architecturally designed comfortable house on two levels. Elegantly appointed with leather sofa, minimalist furniture and fittings. Quality appliances including high definition TV, DVD player, and sound system. WIFI with 4G network and unlimited Netlix streaming. Stainless steel well equipped kitchen. 2 queen bedrooms with high quality bedding. Portacot and cot linen available; select extra option. Child proof internal 'fence' available at request. Bathroom with bath and shower; and laundry facilities. 2 private outdoor rooms to enjoy the fresh Tasmanian air. Private parking bay on the property. Special rates available for longer term stays. The Arthouse is a stand alone private house on 2600m2 of sloping land looking onto the bush and city with filtered water views. 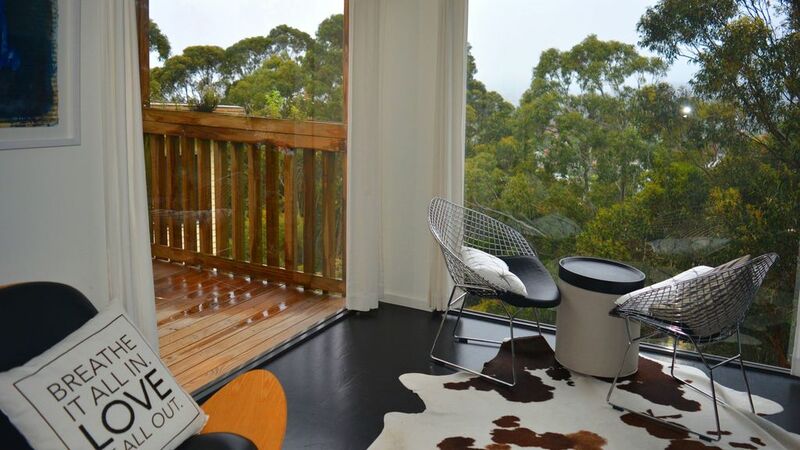 The Arthouse shares this area with a second property, joined by a large deck area that is part of Arthouse Hobart Two. West Hobart is one of Tasmania's best suburbs, recently listed as one of the top 100 suburbs in Australia. Peaceful, secure and centrally located to all that Hobart has to offer. In the heart of Hobart's walking trails including the Rivulet and Knocklofty Reserve. 3 minute drive to cosmopolitan North Hobart with cafes, boutiques, restaurants, book shop, art gallery and art house cinema. Taxi fare around $10 from the house to the city centre. Short walk to award winning Pigeon Hole Cafe. approximately 15-20 minute walk to CBD, waterfront and Salamanca place. 15 minute drive to MONA (Museum of Old and New Art). Short walk to West Hobart art galleries and cafes. 20 minute walk or 5 minute drive to Salamanca and waterfront art precinct. Localised walks in the region including the Hobart Rivulet green belt that leads to the city and Knocklofty Reserve, where the colonial artist John Glover painted.. Strictly NO SMOKING and NO PARTIES/FUNCTIONS. Pets not allowed. Please note that check out is by 10 am and check in not before 2pm unless negotiated in advance with the manager. If you leave something behind we will do our best to post it back to you. There is a $50 fee for this service plus postage. I am a full time local artist and live on Bruny Island. This 2600m2 bush property is a beautiful and leisurely 15 minute walk into the city. You can take in all the city sights with no parking stress. And its only around a $10 cab fare to get home. You can also walk around the area which has national parks tracks and also the famous rivulet which runs along the bottom of the Arthouse property. The Arthouse is contemporary, clean and comfortable with magnificent views and peace and quiet of the bush surrounds. Stay close to the city surrounded by the peace and tranquility of the bush. Contemporary architecture, stylish, clean, comfortable. Parking on site. Unlimited WIFI, Netflix, AppleTV. Comfortable new beds, great views, extremely relaxing. Shower, bath and separate toilet. The laundry is compact inside a cupboard in the bathroom. There is no dryer but there is a clothes line on the downstairs enclosed deck. We are on the fringe of the CBD, a 15 minute walk or less than 5 minutes by cab (about $10). We are also very close to a bus route. We look onto the mountains and hills in the region. We also look towards the Hobart waterfront. Mount Wellington is visible from the top of Arthouse Hobart. Had a great time. Great location. Nice ambience. Lots of hoppy things. Highlight of the stay was a day trip to Maria Island. "Oh give me a home where the wombat doth roam, ..."
A pleasure to host your stay Ian. May all the hoppy experiences remain fresh in your memory. We’ll let our resident wallabies know you’re thinking of them. Thanks for choosing Arthouse Hobart. We’d love to welcome you back. We could still enjoy the trees and lovely wallaby family and their daily visit and be within walking distance to the city. We watched wallabies grazing in the garden while we relaxed in the comfort of the living room. The beds are such high quality we couldn’t get up in the morning. But then we decided to have breakfast on the deck and watch the breeze wafting through the trees. Totally relaxing; totally comfortable; totally close to the city centre and the famous Salamanca market. We found the design and decor of the house really interesting. The outlook was great and we loved watching the potteroos feeding in the garden. Our stay was very comfortable and we appreciated the extra pantry items. We can highly recommend Pigeon Hole cafe for breakfast, as well as Templo for dinner. They were both great food experiences and we enjoyed a warm welcome at both locations. We had a great weekend, very quiet area with no street noise & close to the city & surrounding suburbs, a very comfortable stay & wouldn't hesitate to stay again. Such a beautiful spot 5 min drive from the city. Lovely views of the mountain and down to the water, quiet stunning area, great walks - and all close enough to Salamanca to walk! We were so pleased with our choice I cannot recommend it enough. Was lovely to look out and see wallabies in our back and front yard! The house makes the most of the views and whether you want heat or breeze it is set up to catch either. The kitchen was well stocked with all the basics - coffee, tea, sugar, spices - and everyone leaves something behind in the cupboard so there is quite a choice. We were lucky enough to meet Caroline & Matt who were so accommodating & recommended great places for us to check out. Do yourself a favour and try Pigeonhole for the best coffee! My family loved this spot and this house. We will definitely be back! It was lovely to meet you and your family. So glad you had a great time. We look forward to welcoming you back. We are on the fringe of the CBD, a beautiful downhill 15 minute walk or less than 5 minutes by cab (about $10). We are also very close to a bus route. We look onto the mountains and hills in the region. We also look towards the Hobart waterfront. Mount Wellington is visible from the top of Arthouse Hobart. We have wonderful national parks and walks only minutes from the Arthouse. It is a great location to see the city, but also to enjoy the natural surrounds.